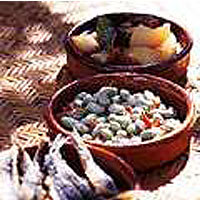 Heat the olive oil in an *earthenware pot or cazuela. Sauté the chorizo, then add the onion and garlic. Cook for a few minutes. Add the potatoes and season with salt and pepper, the bay leaf and the paprika. Stir a little and pour in the wine. Add a little stock or water and cook very slowly for 45 minutes or until ready. The potatoes will be firm, but all the liquid should have evaporated. * If you don't have a heatproof earthenware pot then use a heavy based pan. This recipe was first published in May 1999.